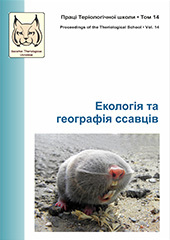 The volume deals with current research on mammals mainly of the fauna of Ukraine. In total, there are 24 contributions in this issue, grouped into 7 sections: Fauna and Systematics (6), Mammals in Collections (3), Research on Species (6), Mammalian Ecology (4), Fauna Protection (2), Notes (2), and Information (1). The specifics of this volume are sections with research based on mammalian collections and study of certain species. Zagorodniuk, I. The “ground hare” in Eastern Europe: Ochotona or Allactaga?